Junk and Rubbish Removal Services in New Mexico. 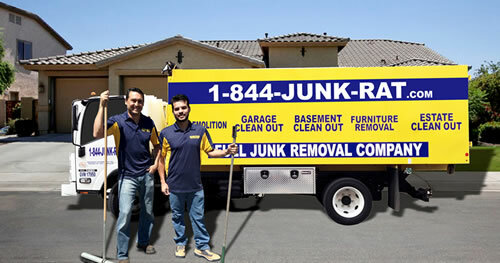 At 1844-Junk-Rat – junk and rubbish removal in New Mexico is made easy… because we do all of the work! Are you stressed about how to get rid of excess waste or construction debris from your home or business? Let the professionals at 1844-Junk-Rat.com handle the heavy lifting and take away your stress in the process. When you call our office to set up your junk removal, basement clean out, yard clean up, or debris removal job, we will give you a no obligation quote before we start working. We have a transparent pricing model that allows you to budget accordingly and our rates are so affordable that you won’t have to worry about a job half done. When our haulers come out, we haul, load, sort, recycle and dispose of any items cluttering up your space so you can get your location back to excellence. We offer services all over New Mexico in order to maintain client’s satisfaction. We did a simple make-over of our kitchen last week and needed to find a company to deal with our old refrigerator. Since we used 1844junkrat.com/ for our construction clean up project we knew from experience that they were clean, dependable and reliable. At that time we had a lot more junk though the rate was still very affordable so we decided to give them a chance with out Refrigerator Removal. As expected, when we called their office we were greeted kindly and a time was set up for the next day. Two guys from 1844junkrat.com/ came out, on time no less, and had the old fashioned, heavy and cumbersome fridge loaded in about 20 minutes. The cleaned up the nook the fridge had been sitting in, which is great since it hadn’t been cleaned in 20 years! They really do pride themselves in their work so their motto “we are the junk people” is in line with their stellar service.